It's no secret that I love casual basics. Jeans, sweaters, tanks and blouses are just some of my wardrobe staples. I love that they're all interchangeable, classic and perfect for everyday. Since less is always more for me (especially these days with a newborn), my simple diamond studs and favorite delicate necklace were all the accessories I needed. P.S. - Congrats to Molly S. on winning the Avalisa letter print. I will be emailing you later today! You look as stylish as ever! 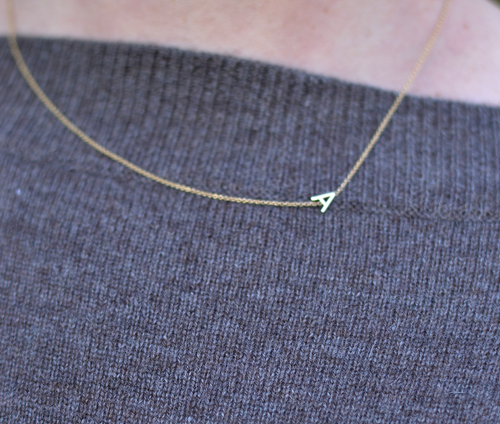 You can't go wrong with basics like this - adore that little necklace too! Simple, but beautiful. I love the necklace. Congratulations on you baby! I love how simple and chic this look is! i couldn't agree more with the simple staples! love vince sweaters, they are so easy to wear and have such a great fit. you look lovely! I agree - simple & classic pieces are a must have. When thrown together into an outfit, the look is sophisticated and chic. I hope you & Eliana are doing fabulous! This is my favorite kind of outfit. I lived in almost this exact look when I was the mother of a newborn- Now a mother of a toddler, I tend to wear flats or wedges as it is easier to run after my terror in them! one of these days i will get one of those adorable necklaces! =) and i agree with the previous commenter, you rock a sweater girl! I love your delicate necklace! I need a sweater like that in my wardrobe asap! you look gorgeous! and i love that dainty necklace! and yay! thank you so much for the print giveaway! so excited! I love this outfit! I've been very inspired by looks just like this lately - very simple... and that necklace is so amazing! Did you give birth already? You look fantastic. The outfit looks good too. You look so pretty. Congrats on the new baby girl! What NIFTY little necklace, it's soooo delicate! hi dear! i just found your blog and i love it!! would you like to follow each other? LOVE that sweater, Audrey! This look is so "you." :) P.S. I have the same necklace, but with an "R!" Don't you love it! ?